Are your kids getting ready to go back to school? I have 4 and most are pretty excited, but of course, the nerves are there too. My oldest is going into 10 grade and is finally at the high school, my next two are in 9th and 8th and in jr. high, and youngest is in 6th in the elementary school. 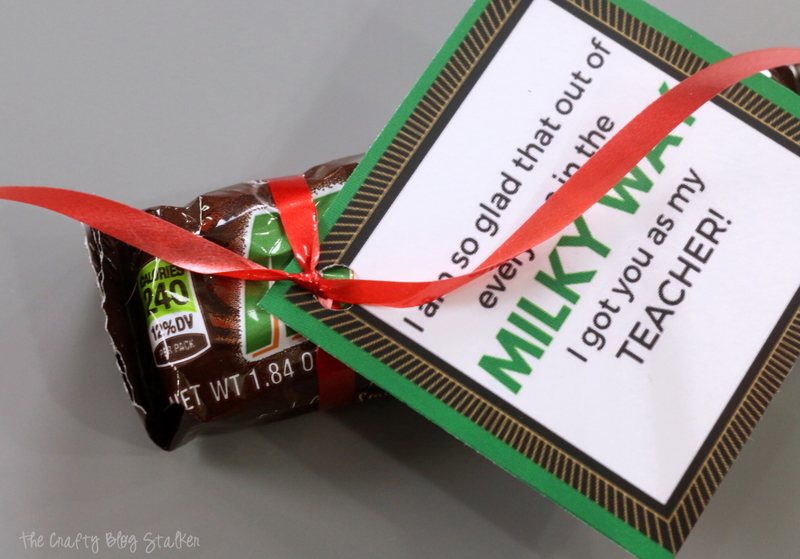 Since my kids are getting older and have 8+ teachers each, it is much more difficult to send them with a teacher gift for each teacher. Plus, who wants to be seen giving a teacher gift – especially in high school! From what I understand, this puts their cool factor at stake. So this year I simplifying. I created a free downloadable printable that can easily be attached to a candy bar with some curling ribbon. My high schooler son opted out of the gifts, but my girls are super excited to give a little treat to their new teachers. 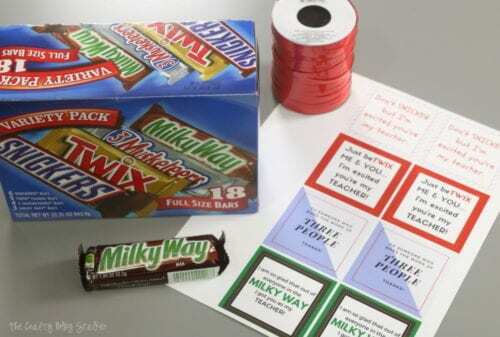 The tags that I created are for the candy bars Milky Way, 3 Musketeers, Twix and Snickers. That is why the 18 count box is so perfect for this project. Click here to download the Printable Candy Bar Tag and then print. Print at home or take to your favorite printer. This is what each tag says. Snickers – Don’t SNICKER but I’m excited you’re my teacher. 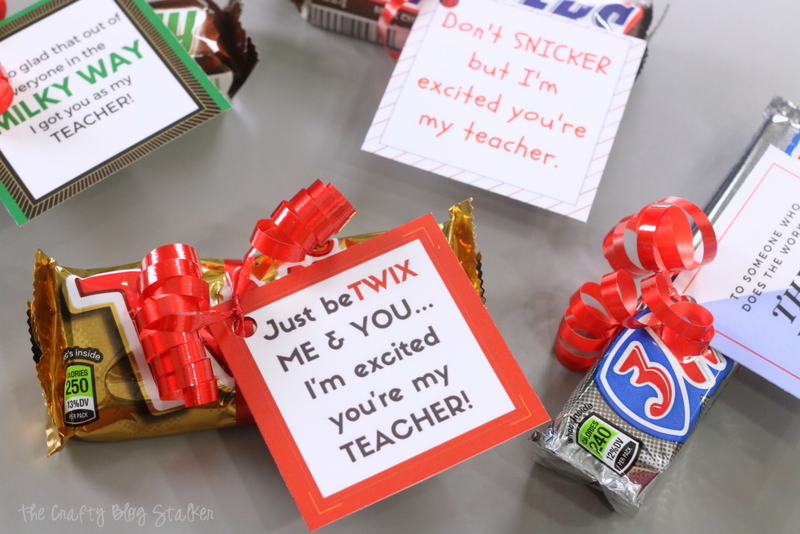 Twix – Just beTWIX me & you… I’m excited you’re my teacher! 3 Musketeers – To someone who does the work of THREE PEOPLE. Thanks! 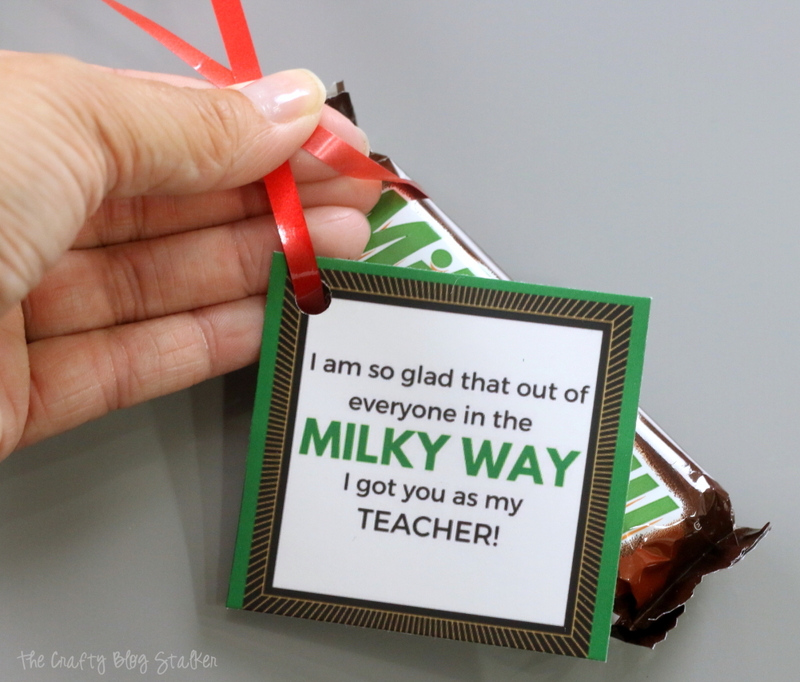 Milky Way – I am so glad that out of everyone in the MILKY WAY I got you as my teacher! Using a paper trimmer, cut out the square tags. Punch a hole in the upper left-hand corner of the candy bar tags. Cut a piece of curling ribbon that is about 12-18 inches long. You want the piece a bit longer so there is extra ribbon to curl. 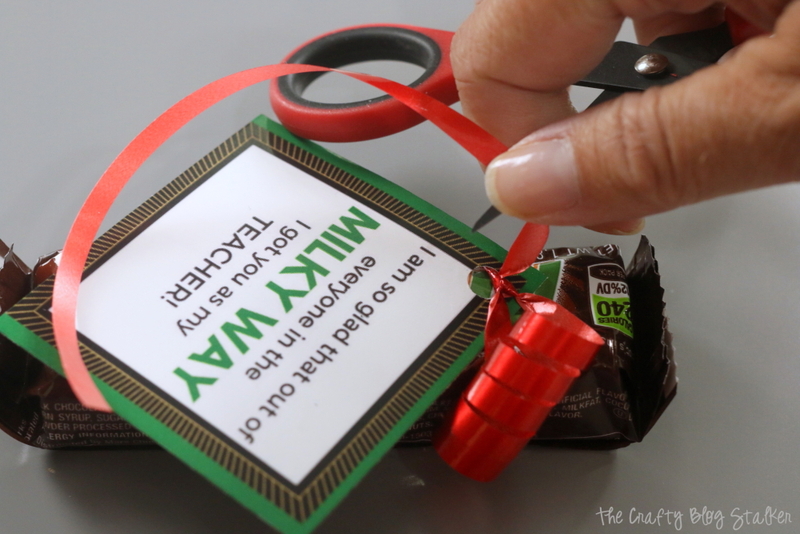 String the ribbon through the hole in the candy bar tag and wrap around the bar. Tie a double knot keeping the ribbon tight around the candy bar. Curling ribbon generally has two sides. A shiny side and a dull side. The dull side is the back of the ribbon. Open a pair of scissors and holding the dull side against one of the blades of the scissors with your thumb, tightly pull the scissors up the length of ribbon. This will create the curl. Not all ribbons will have this effect, so make sure you are using curling ribbon and not a fabric ribbon. Not all ribbons will have this effect. This only works on curling ribbon so make sure you are using the correct ribbon and not a fabric ribbon. If you have never curled ribbon before, you may want to practice a bit first so you can figure out the right amount of pressure to apply to the scissors and ribbon. 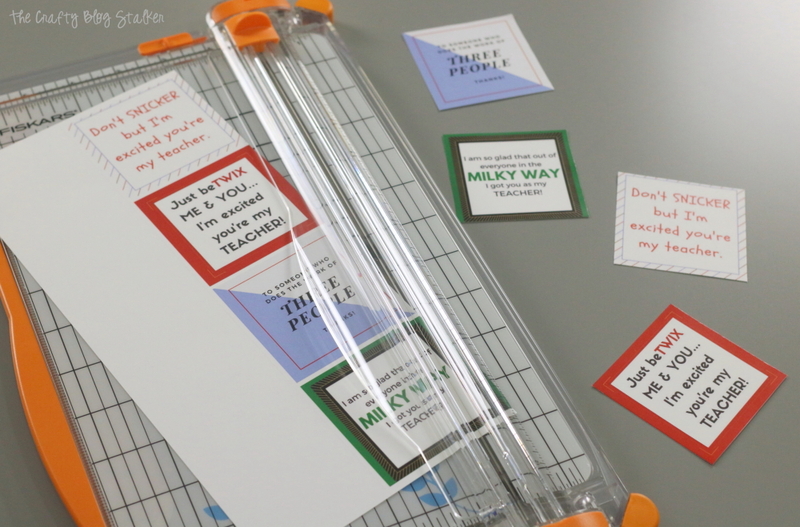 This teacher gift idea comes together quite quickly and is simple enough to let the kids create their own gifts! My girls that have several classes with different teachers are going to give each teacher a candy bar, and my daughter who only has one teacher is going to give her teacher one of each! What grade are your kids going into? Are you ready for Back to school? Share and leave a comment below! 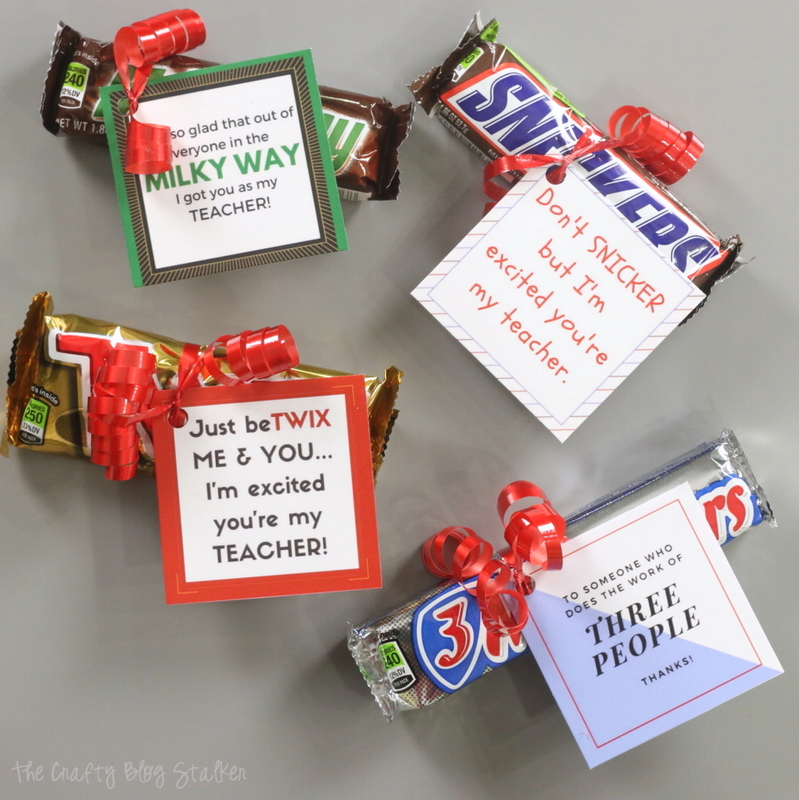 SAVE HOW TO MAKE A CANDY BAR PRINTABLE TEACHER GIFT IDEAS TO YOUR FAVORITE DIY PINTEREST BOARD! Thank you Edye! I am so glad you like this simple DIY craft tutorial idea. Cute printable!! Makes me want to print out some for Monday when school starts! Thanks for sharing at our Craft Party on Thursday!! Your DIY will get featured! Come check it out and share your latest projects with us! Thanks Denise! You totally should. It’s a simple gift that says thank you but doesn’t take a lot of time to put together. 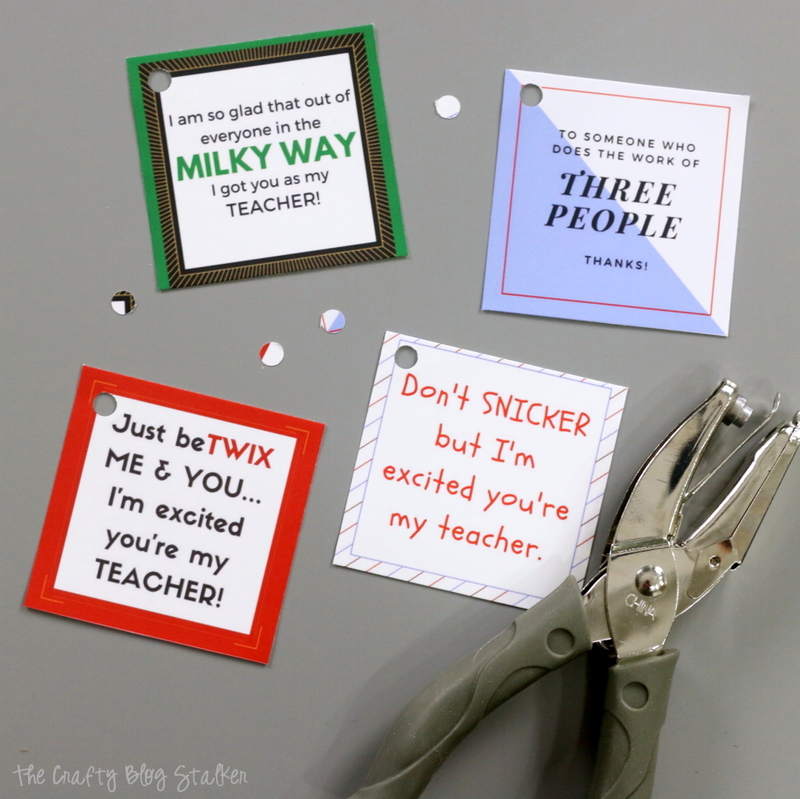 Great gift for any teacher! Thanks, Liz! My kids loved handing them out to their teachers!